Made a few mistakes but pleased! Hope all is going well. Thought I'd send you a quick snap of my first attempt since the course back in April. All in all, I'm pretty pleased. I made plenty of mistakes (first batch mixed too strong, second batch mixed too much, trowel technique a bit dodgy and probably not enough pressure), but it seems to have come up okay. 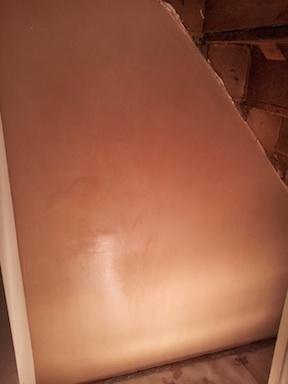 I seem to be getting some tears in the plaster when I am doing the final trowelling - any ideas what I might be doing wrong? Do I need to wet it more? Anyway, cheers again for all your advice. Join in and write your own page! It's easy to do. How? Simply click here to return to Feedback / Achievements.